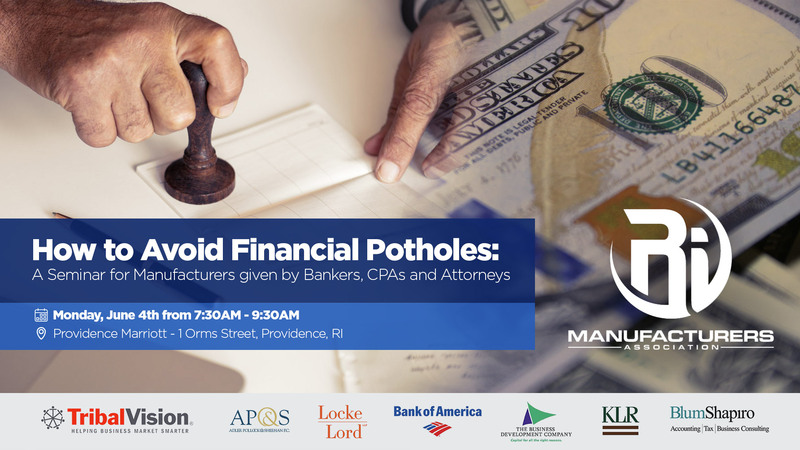 RIMA will hold its next free seminar on Monday, June 4th at the Providence Marriott, titled “How to Avoid Financial Potholes: A Seminar for Manufacturers given by Bankers, CPAs, and Attorneys.” This event will focus on the importance of manufacturers to have a good banker, CPA, and attorney who understand their operation in order to effectively avoid financial potholes. A wide variety of presenters will be in speaking to offer their insight, including Steve Ucci from Adler, Pollock & Sheehan Law Firm; Mark Freel from Locke Lord Law Firm; Kevin P. Tracy from Bank of America; Peter Dorsey from The Business Development Company; Anthony Mangiarelli from KLR; and Michael Karolewski from Blum Shapiro. Previous articlePaying for badly needed school upgrades now will limit future borrowing. Can the state afford it?